Dynatech SuperMAXX Stainless Steel Long Tube Headers incorporate the latest in racing exhaust technology for increased horsepower and torque. They feature all T-304 stainless steel construction for strength and durability, along with CAD-designed Aero-flow collectors. They have CNC laser-machined flanges and are designed to fit in the stock location. 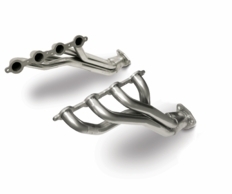 By reducing exhaust restriction via their precision bends, your new Dynatech Headers will result in more horsepower and torque. Their superior quality means they are built to last. Your Dynatech SuperMAXX Stainless Steel Long Tube Headers come with everything you need to complete the installation. Brand new header bolts, 02 sensor extension cables, triple layer stainless steel gaskets, complete installation instructions with photos, and a limited lifetime warranty are all included. NOTICE: When combined with a Dynatech intermediate pipe, these headers are a bolt on solution. If not used with a Dynatech Intermediate Pipe, these headers may require welding/fabrication in order to install to your factory intermediate pipes! The part number for this item is 715-24110 and it fits 2007-2010 Chevy Silverado GMC Sierra 2500HD (6.0 V8 Models). Primary Diameter: 1.75" Collector Diameter 3". 15 hp and 38.5 Ft. Lbs. of Tq.